My little man loves animals and animals figures. 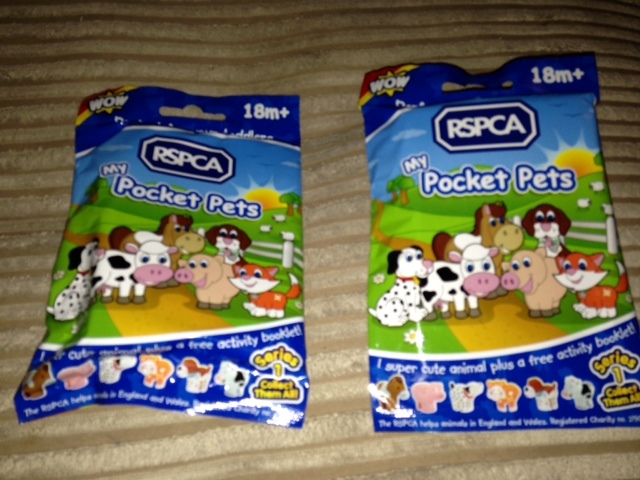 So when I got the chance to review the new RSPCA pocket pets from WOW toys I could not wait to receive them. These fun little animals are sold in packets and each pack contains one animal figure. 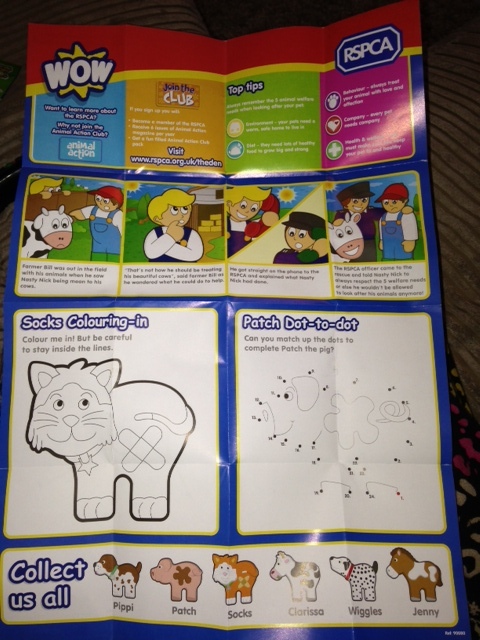 Also contained in the pack there is an activity booklet, which has a dot to dot on, a short story and colouring in. 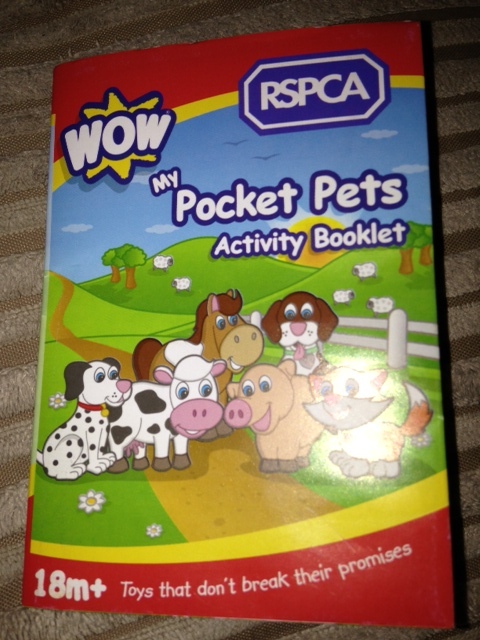 There is also information about all the other WOW toys you can buy and details to signing up to the RSPCA club. The story is about a man who is nasty to his horse. Someone sees him being nasty and reports him to the RSPCA who then come out and check what is happening. They advise the man that he will not be able to keep animals if he treats them bad. This is a great little story to teach children about animal welfare and treating animal in the right way. The animals are aimed a children ages 18 months+. 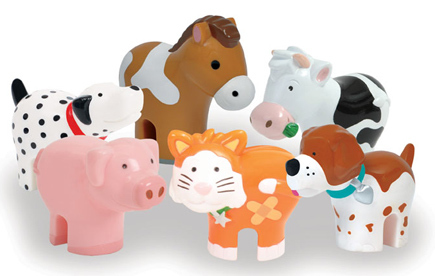 There are 6 of these little fellas to collect Socks the cat, Pippi the pooch, Clarissa the cow, Patch the pig, Jenny the horse and Wiggles the Dalmatian dog. These little animals can be bought for £1.99 and they can be bought from a number of high street shops including Tesco, Amazon, Waterstons and some RSPCA outlets. The is also going to be some Post Offices and newsagents that they can be bought from. This is a great cause as the kids love to play with the animals, and the RSPCA get valuable funds to help them with the absolutely amazing work they do with animals. We were sent 2 of the RSPCA pets to review, however we received 2 the same. 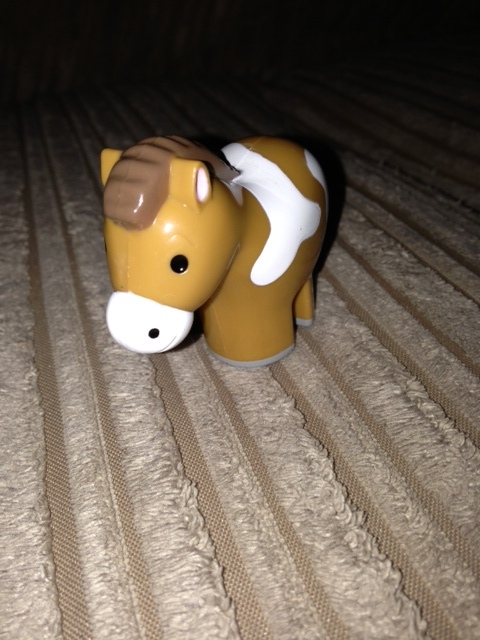 so here is a picture of the horse we received. Little man loves his new toy. Little mans favourite is the Bath time friends. He has the boat with the divers and a whale. I have been given the chance to run a competition for someone to win 2 of these cute little animals. If you would like to win 2 little RSPCA animals then all you have to do is… Leave me a blog post comment on why you think your little one would like the animals. Then please tweet about the giveaway and let me know you have done so. 2 little animals could be on their way to you. Competition closes Wednesday 20th March 2013 at 1300. Previous Post Monday 11th March 2013. Mothers day. love to win to add on to our collection! My 2 year old daughter loves animals and really likes little toys she can put in her pocket or carry in her back pack so she would love these. My little boy loves animals he’s always singing Old MacDonald had a farm so I know he would love this! would like to win this to put aside for my grandchild, they are very cute. My 2 daughters would love these. Ever since we visited Edinburgh Zoo last Easter, they are animal mad! We will be visiting a local farm this Easter and hopefully see some baby animals! We have loads of pets from cats to dogs and bunnies so animal mad in our household! My little girl would love these – anything dinky and cute and it becomes an instant favourite. She is always carrying around little animal toys and trinkets and wanting to take them into pre-school for show and tell! 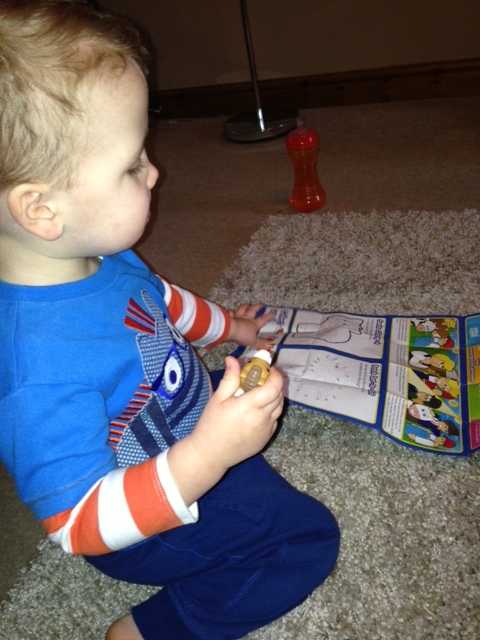 My son would like thse as he likes little things he can keep in his pocket and coat and keep on him at all times! My Daughter would love this as she loves animals and could add them to her farm ! My little girl would love these as she likes to play with animals and make the noises. Sorry cant tweet, no twiiter account.